Mistake-proofing, or Poka-Yoke (pronounced POH-kuh YOH-kay) as it’s known in Japan, is an action you take in Six Sigma to remove or significantly lower the opportunity for an error or to make the error so obvious that allowing it to reach the customer is almost impossible. Poka-Yoke is one of the simplest tools to master; it’s very consistent with the fundamental aims and philosophy of Six Sigma, and it has wide applicability in manufacturing, engineering, and transactional processes. Poke-Yoke involves creating actions that are designed to eliminate errors, mistakes, or defects in everyday activities and processes. 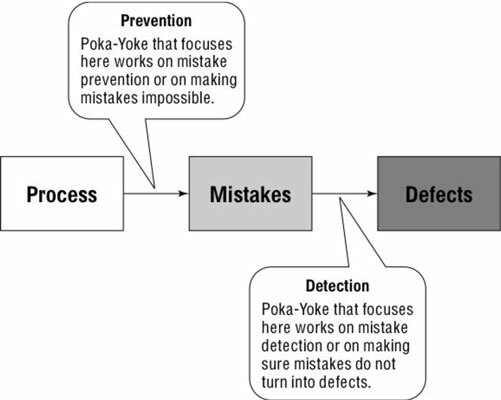 Poka-Yoke starts with an understanding of the cause-and-effect relationship of a defect, followed by a remedy that eliminates the occurrence of the mistakes that lead to that defect. Poka-Yoke solutions can include a simple physical feature, the creation of a checklist, a change in the sequence of operation, a highlighted field on a form, or any other way of helping to totally reduce or eliminate mistakes. You can find a number of everyday examples of Poka-Yoke. Look at the connector on a cellphone charger. Its shape prevents you from connecting it in the wrong place or turning it incorrectly, damaging your phone. Computer data entry forms won’t let you advance until all the information is input correctly. Checklists are used so items aren’t inadvertently missed. Process workflow is automatically routed and executed. The objective of the Control phase is to establish measurement points for the critical Xs and other significant parameters of the process to assure that the CTQs are predictable and meet established requirements. Different levels of control have different levels of effectiveness. The most effective form of process control is sometimes called a Type-1 corrective action. This control prevents the error condition from ever occurring, which is the primary intent of the Poka-Yoke method. The second-most effective control is called a Type-2 corrective action. This control detects when an error occurs and stops the process or shuts down the equipment so the defect can’t move forward. It’s the detection application of Poka-Yoke.